Before the advent of the measles vaccine, the United States saw hundreds of thousands of cases of measles every year, with an average of half a million cases per year, leading to 400-500 deaths annually, about 1,000 cases per year of brain damage due to measles encephalitis, and a yearly average of 48,000 hospitalizations [ibid] (at a cost of nearly $10,000 per hospitalization). It also caused varying degrees of hearing loss due to ear infections, not to mention diarrhea potentially severe enough to cause significant dehydration. Beginning with the 1-dose MMR schedule, measles incidence plummeted. The addition of a second dose of measles vaccine eliminated the disease from the U.S. Measles was declared eliminated in 2000, meaning that the virus no longer circulated among the population through sustained transmission. The only cases seen in the country were imported or linked to a patient who imported the disease. 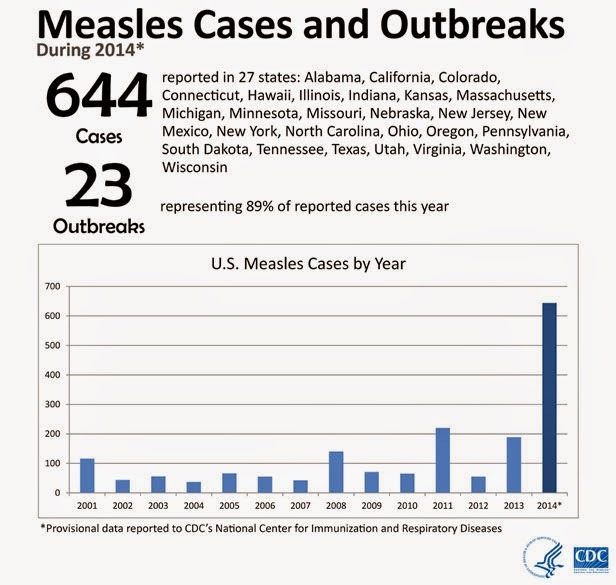 This was a major victory in public health, since measles is one of the most contagious diseases known to humans, with a roughly 90% infection rate. Since elimination, it became rare to see more than 100 cases in a year. But as pockets of vaccine refusal have increased, so too have measles rates. In the past several years, we have started seeing larger and larger measles outbreaks. The year 2011, for instance, saw several big outbreaks, such as the outbreak in the Minnesota Somali community. In all, there were 222 cases of measles, a 15-year high. About one third of those who contracted the disease were hospitalized for it. Most of those infected were either unvaccinated (69%) or did not have vaccination status available (21%). Two years ago, in 2013, we also saw several large outbreaks, including a single outbreak involved 58 cases. And then there was last year. At 644 cases, 2014 was an historic year, thanks to anti-vaxers. It was more cases than the previous five years combined and the most we've seen in a single year in over 20 years. In just the first month of this year we've already seen almost 100 cases of measles, most linked to a single outbreak originating in Disneyland. That's more in a single month than an entire year's worth of measles cases in 9 of the last 14 years. It's not quite all doom and gloom, though. The media and greater public are finally starting to realize what science and public health bloggers, physicians, and state and federal departments of health have been saying for a long time. Particularly with last year's record numbers and the current outbreak, anti-vaccine activists are being called to task. Due to their activities, large pockets of unvaccinated children are triggering and fueling these outbreaks, and journalists are taking notice. Once upon a time, anti-vaccine activists got their say in the press. They frequently went unchallenged when they falsely claimed that the MMR, thimerosal or some other aspect of vaccines caused autism. Now it is rare to find them given such leeway. Instead, articles cite physicians and scientists, the ones who actually have the pertinent knowledge and training on diseases, vaccines and immunology, rather than University of Google graduates who think a few hours of reading random web sites makes them an expert. The anti-vaccine movement is not happy about this turn of events. They are feeling the heat. Like Kate Tietje (aka Modern Alternative Mama), they view criticism and statements of fact as "bullying" and who asks to see "just ONE [sic] case where an unvaccinated child contracted an illness, passed it on, and that person died." (Here's one: Natalie got measles from an unvaccinated child when she was 11 months old, developed SSPE in 2007, and died in 2011. Or Micha.) Like Dr. Bob Sears or Dr. Jay Gordon, they try to downplay the risks of measles. The former calls his critics "stupid" and argues we should go with the "status quo" of not preventing measles. The latter opines that he doesn't "think it poses any risk to a healthy child...Measles is almost an always a benign childhood illness." To underscore this, Dr. Gordon observes that "Measles isn't coming back. We have 70 cases of measles right now and we have 30 million Californians," once more illustrating his magical math. And it isn't just journalists that are speaking up on this subject. Parents are speaking out, too. Jennifer and Dave Simon are angry that vaccine refusers put their infant daughter, Livia, at risk. Carl Krawitt wants unvaccinated kids kept out of his son's school. His son, Rhett, is especially vulnerable to infection because of the chemotherapy that helped him fight leukemia. Stacy Hillenburg's son, Ben, is a heart transplant recipient. The immunosuppressants he takes to prevent rejection of the heart mean that not only can he not get the MMR vaccine, he is at increased risk of complications from measles. Parents are opting to not vaccinate their kids, and their kids are opting to get sick. We asked the question, 'Are vaccinations dangerous?' Yes, if you don't get them! He correctly notes that the Disneyland outbreak is primarily due to parents refusing to vaccinate their children. This "trend", he notes, is thanks to Jenny McCarthy and Andrew Wakefield. Although they are old news at this point, Wilmore uses McCarthy to illustrate the University of Google approach to "research". He features clips from bioethicist Art Caplan, neurosurgeon Sanjay Gupta, MD, philanthropist and global health advocate Melinda Gates. His guests included CBS News medical correspondent Holly Phillips, MD, comedian Judy Gold, comedian and Nightly Show correspondent Mike Yard, and anti-vaccine activist Zoey O'Toole (aka "The Professor" at Thinking Moms Revolution). If a vaccine for autism came out now, would you recommend it? No. I wouldn't trust it. That thought has occurred to everyone who has decided not to vaccinate. The important thing to remember is that we all want to do what is best for our children...As a parent, I was given my child, and your job as a parent from the moment your child is born is to protect that child with every ounce of your being. She does not spare a thought for how the decision affects others, though. Her attitude is indicative of the self-centered "me and mine, screw you and yours" mentality common among those espousing the anti-vaccine attitude. O'Toole also trots out other common tropes, such as how vaccine manufacturers derive profits from vaccines, as if making money on a product that saves lives is somehow wrong. Does she chastise, say, quack Joe Mercola for profiting from the products he sells and writes glowing copy about? She mentions that safety studies are conducted by the manufacturers, which is true, but fails to note all of the other studies done by independent researchers around the world. Next up is the "CDC whistleblower". She repeats the myth that the CDC had data showing an increased risk of autism for black boys vaccinated on-time with MMR. Unfortunately, no one challenged her assertions. It is a good thing to finally see the media, parents, and entertainers shining a light on the effect anti-vaccine activists are having on public health. Last year's historic number of measles cases and the current Disneyland outbreak serve as poignant backdrops on how anti-vaxers have gotten their wish: lower vaccination uptake in pockets around the country. But now that the reality of what their choices mean is starting to hit home, like the mayor in The Pied Piper of Hamelin, they don't want to take responsibility. Sorry, anti-vaxers, but it's well past time to pay the piper. Might be a good time to suggest some appropriate policy changes to protect children like Livia, Rhett, Ben and others. And yes, with freedom should come responsibility.